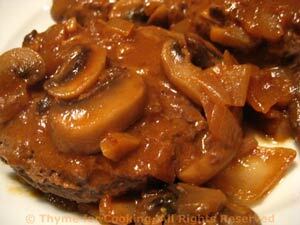 Skillet Burgers with Mushrooms, from Thyme for Cooking's Weekly Menu Planner. We'll finish up the mushrooms with this dinner, most for the beef patties but a few in the quinoa. 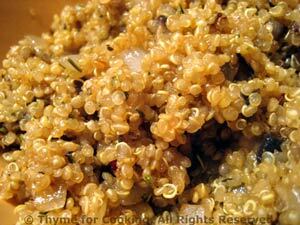 Sauté the onions and mushrooms, then divide and stir some into the quinoa before serving. Use wild or exotic mushrooms if you can. It's the season and we may as well take advantage. But even the plain white button or brown cremini will make a delicious sauce. Finely chop onion, mince garlic. Finely chop about 1/4 of the mushrooms. Thickly slice the rest. In large nonstick skillet over medium heat sauté 1/2 the onion, the garlic and chopped mushrooms about 5 minutes or until tender. Put bread crumbs, basil, 1 tbs ketchup, soy sauce, and 1 tbs stock in medium bowl and mix well. Add the beef and sautéed onion mixture. Mix well - hands work best, and form into 4 patties. Return the skillet to medium heat. Add the burgers and sauté, 5 - 7 minutes per side. Add mushrooms and remaining onion to skillet and sauté about 5 minutes or until tender. Add beef stock, mustard and ketchup to pan and bring to a boil, stirring to mix well. Return patties to pan. Reduce heat and simmer 5 minutes to blend flavors and heat patties. Serve. Horseradish and sharp mustard add a nice zing to cauliflower. Cut cauliflower into pieces, put into a steamer basket and steam over water for 12 - 15 minutes, just until tender. Remove and drain water from pan. Add mustard, horseradish and tarragon, stirring well to combine. 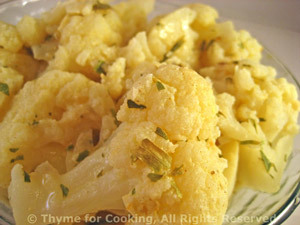 When hot, add cauliflower and stir gently to combine and heat through. Serve.